After a few weeks of getting a chance to pull this together, I finished creating the Outline & Shade Pack. This pack will help you create fashions easily with guided cutting and shading templates. You have the option to use the outline, shading, or both with 9 different fashion designs. 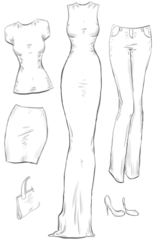 The pack includes: Gown, Dress, Tee-shirt, Skirt, Shorts, Pants, Coat, Purse, and Shoes. You can find this pack for sale in the bank now for 500 points so give feedback on this first designing package! Note: I will be making a video for help and tips on how to use this pack very soon. love it thanks, just wondering will there ever be outlines for interior? Maybe down the road Ill do a pack for that too :) I plan to add many more different "packs" for sale in the bank to buy and use with designing. I made a Video Tutorial on how to use these Outlines. They look great-love the idea and how they turned out! I think many members will find them extremely useful!! I finished the video to help with the Outline & Shade Pack. Watch this video for help with using them and some extra tricks for easy designs!